8 Kid Friendly Things to do in Washington D.C. When you rent a timeshare for your family's vacation, you know that you're getting budget accommodations at a luxury resort; you're getting the many amenities that the resort has to offer; you're getting spaciousness including real bedrooms, a living room and a dining area; and - you're getting a fully-equipped kitchen. For many of you wives and moms, the idea of vacationing someplace with a kitchen may not be exactly the dream vacation you had in mind. But, you ARE going to save money on the meals that your family does not HAVE to eat out. And, you are going to enjoy the convenience of being able to give your tousle-headed tribe breakfast without the hassle of getting everyone up and showered and dressed and out the door just for a bite to eat. This is your vacation, too, so the meals you prepare in your timeshare kitchen need to be quick and easy, as well as filling and nutritious. 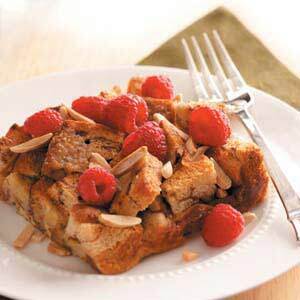 Raspberry-Cinnamon French Toast - easy factor: make up the night before. Place bread cubes in a greased 13-in. x 9-in. baking dish. In a bowl, combine the eggs, milk, 3/4 cup brown sugar, cinnamon and nutmeg; pour over bread. Cover and refrigerate overnight. Remove from the refrigerator 30 minutes before baking. Sprinkle almonds over egg mixture. Combine butter and remaining brown sugar; drizzle over the top. Bake, uncovered, at 400° for 25 minutes. Sprinkle with raspberries. Bake 10 minutes longer or until a knife inserted near the center comes out clean. Yield: 6-8 servings. Morning Fruit Salad - easy factor: just chop and serve. Drain oranges, reserving 4-1/2 teaspoons juice (discard remaining juice or save for another use). In a small bowl, combine mayonnaise and reserved juice. In a large bowl, combine the oranges, grapes, apples, bananas, coconut, walnuts, cherries and raisins. Divide among serving dishes; drizzle with mayonnaise mixture. Serve immediately. Yield: 6-8 servings.